Join up at the Legendary level and get a new PCG-coloured ship skin. 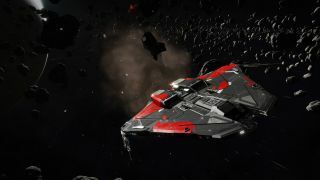 Frontier has supplied us with an exclusive PC Gamer-colored skin for the Krait Mk II ship in Elite Dangerous, a new ship added in its recent Beyond updates. All new members of the PC Gamer Club at the $5 monthly Legendary tier will get a key for this when they sign up—you'll find it in your welcome email. Naturally, you'll need a copy of Elite Dangerous to activate it. That's just one of the exclusive in-game items you get when joining the Club. You can also get another skin for Elite Dangerous—the earlier Cobra—and an exclusive in-game pet for Runescape, among other goodies. You also get a suite of other benefits: the digital magazine sent to your device once a month, a game key courtesy of our partners at Fanatical, access to our exclusive Discord server and more. You can join up here.